It is a great delight to join all of you today for the Seventh World Chinese Economic Summit. I am very pleased to meet so many business leaders from all corners of the world. This is a wonderful opportunity to renew friendship and share ideas and knowledge. • And, in turn, it encourages cooperation for common development. "Mutual understanding and common aspiration make great friendship." • Britain was the birth place of the Industrial Revolution. • The British people are known for their important contribution of wisdom and creativity to human progress. • China is the longest continuous civilisation. • For over two millennia, China contributed many invaluable products to the world, such as silk, tea and porcelain. • But the Chinese people were also highly inventive, producing many scientific and technological innovations. "In technological influences, before and during the Renaissance, China occupies a quite dominating position." In addition to their proud heritage of contribution to human progress, China and the UK also have a long history of mutual trade. As early as in 1497, Henry VII sent John Cabot the navigator and explorer on an expedition to look for a direct maritime route to China. This marked the beginning of direct trade links between China and Britain. After the founding of New China, 48 British companies sent a delegation of their representatives to China in 1953. That was an 'ice-breaking' trip that restored the bridge of trade between the two countries. • In 1980, two-way trade crossed the one billion US dollar threshold for the first time. • In 2014, China-UK trade in goods totaled over 80 billion US dollars. • Britain is now China's second largest trading partner in the EU. • And China is Britain's second largest trading partner outside the EU. • Over 800 Chinese companies have set up businesses here. But the business engagement reaches much further. China and the UK have also taken the lead in financial cooperation. The outcome has been remarkable. London is rapidly building a RMB offshore market. Last month, Chinese President Xi Jinping paid a historic State Visit to the UK and opened up the "Golden Era" of China-UK relations. I have named this visit a "Super State Visit" because of its "super outcomes" and "super significance". • The two countries signed 28 commercial contracts valued at 40 billion pounds. o From energy to transportation. o From aviation and space to port and major infrastructure. o From finance and insurance to pharmaceutical, science and technology. o And from innovation to sustainable development. The GDP of China and the UK combined now reach 13 trillion US dollars. That is about 17% of the world total. • International division of labour. Also, the two countries are at different stages of industrial adjustment and transition. Therefore, China and the UK are well matched for cooperation and they have numerous shared interests. Stronger and win-win cooperation between China and the UK will boost growth and create job opportunities in both countries. This will bring tangible benefits to the people of our two countries. And this will also be the pacesetter for China-Europe cooperation and world economic growth. Right now, China is in the process of formulating the thirteenth five-year plan for the country's economic and social development. Suggestions on the plan have been put forward at the Fifth Plenum of the Eighteenth CPC Central Committee. According to the suggestions, innovation, coordinated, green, open and sharing are the key words for China's future development. The concept encapsulated in the five key words will not only set the direction for China's own future development but also help to set the stage for China's G20 presidency next year. President Xi Jinping will be in Turkey in a few days to attend this year's G20 Summit. He will meet with leaders of major economies to determine their collective actions towards inclusive and robust growth. So, here is China not only formulating a new development concept for herself but contributing it to the world. And then, here is the China-UK relationship entering a "Golden Era". First, high quality trade and greater mutual investment. • This will require wider and more extensive opening up in China. o Enhancing strategic mutual trust. o Advancing economic cooperation and trade. o And deepening people-to-people exchanges. • These will be the enabling factors of deeply integrated and mutually beneficial cooperation. China will follow a proactive import policy. The Chinese market will open up further to global partners. Quality products and services from all over the world, including the UK, will surely find a promising market in China. 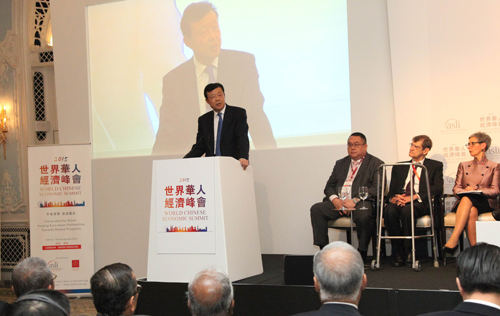 Chinese companies will also step up their efforts at taking their investments overseas. I am sure they will find Britain's mature and open market most attractive. The second area where China and UK can collaborate more closely is joint R&D and innovation. There is huge potential in this area. In China, the thirteenth five-year plan has placed innovation at the centre of its focus. This level of emphasis means that innovation is going to be the line that will run through all of the Party and Government work. In the UK, innovative capability is your leading edge. High-end manufacturing is your strong suit. These strengths, combined with British R&D muscle and talent pool, have come together to make the UK a major R&D and design centre of hi-tech and high value-added industry. Going forward, Chinese and British enterprises can dovetail their strengths in joint investment, R&D, innovation and marketing of research results. Together, both countries can benefit. This will be a win-win endeavour. 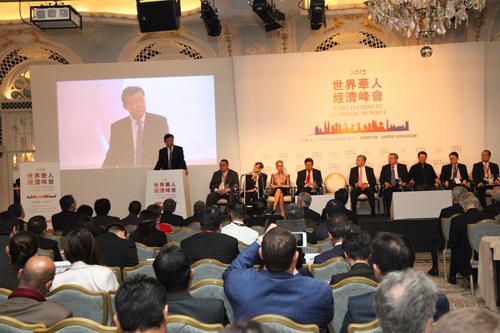 The third area where China and the UK can work together is the modern services industry. • This includes providing better and easier investment and business environment for British and other foreign companies. • As a result of these efforts, British financial institutions, law firms, innovation companies, marketing corporations and others will be able to leverage their strengths in China. • And at the same time, Chinese enterprises will be able to benefit from the expertise of their British partners and build their own competitive edge. Last, but not least is infrastructure development. China and the UK can engage in bilateral as well as international cooperation in this area. China's "Belt and Road" initiative and Britain's Northern Powerhouse provide the perfect platforms for the two countries to cooperate on a greater, higher and wider scale. Here, China's equipment manufacturing capability and ample capital resources could join forces with British innovative skill, management expertise and strength in financial services. This would open up entirely new areas for economic cooperation between China and the UK, namely investment, development and management of infrastructure projects in third countries. In the English language, entrepreneurship has many definitions. The most important ones can be found with innovation, cooperation, trust, learning and service. 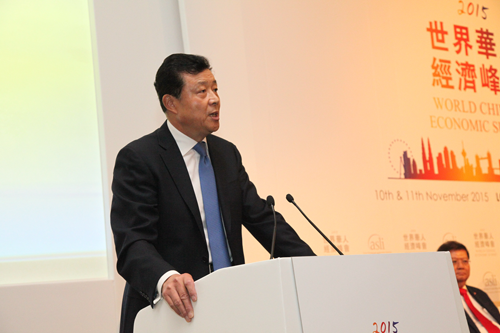 In my view, the business cooperation between China and the UK embodies such entrepreneurship. Such cooperation is not only a perfect epitome of the business ties between China and developed countries. It also shows the next step such ties should go in the new era. As we stand at this new historical starting point of a "Golden Era", I sincerely hope that the business communities from China, from Britain and from all over the globe will carry forward this entrepreneurship. I hope you will seize the opportunities and join in to take our cooperation to a higher level. 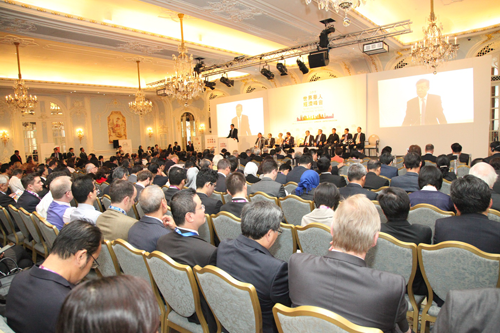 Together, we can build a golden era for China-UK economic cooperation. Together, we can write a splendid new chapter of cooperation between China and the rest of the world.